To knot or not to knot… that is the question! Do you know the difference between an albright and a woggle or an alpine butterfly and a west country whipping? Probably not. The good news is that you don’t need to. As a traveller of the inland waterways there are really only two knots you need to know, but you really do need to know them. Let me give you an example of what can happen when you don’t. 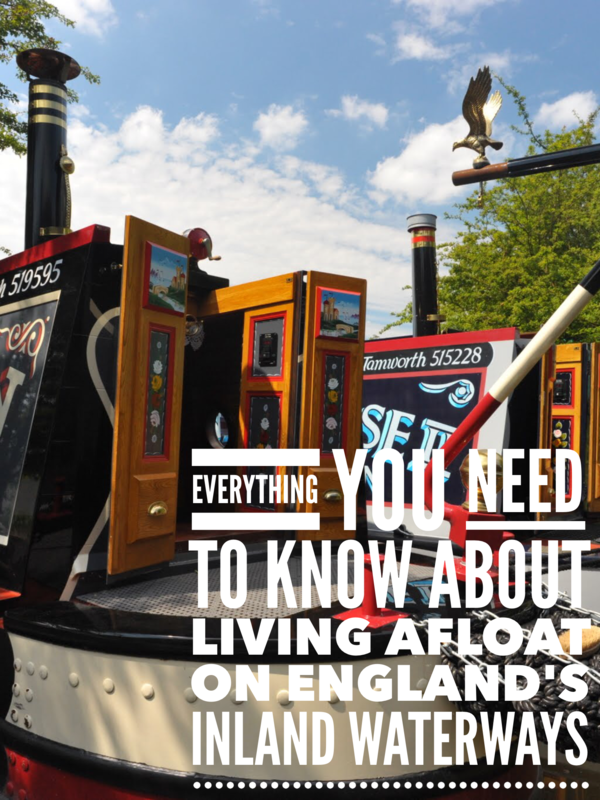 When I was seventeen (I know, I must have a very good memory – three male friends and I drove to somewhere near Great Yarmouth to the start of our week long narrowboat holiday. After half and hour’s instructiion we were allowed out on the Norfolk broads on our own. By five o’clock we thought we had travelled far enough so “parked” our new toy along a canal bank near a likely looking pub. Six hours later and a little the worse for wear, we staggered through the driving rain through the pub garden back to where we were sure the boat was moored. Of course we weren’t thinking straight so after a brief panic and a longer shouting match we raced up and down the bank searching for our new home. After ten minutes we found the boat. Actually “found the boat” isn’t quite right. We hadn’t lost it at all. The idiot responsible for tying the stern mooring line (me) hadn’t done a very good job so the boat had swung one hundred and eighty degrees downstream and had come to rest alongside another narrowboat. Of course it was very difficult to see it in the driving rain. If I had known either of the two most useful narrowboat knots we would have been spared the heartache all those years ago. Of course, my experience resulted in nothing more that a minor irritation but there have been countless cases of boats drifting away from their moorings because of poor knot tying… sometimes with disasterous consequences. 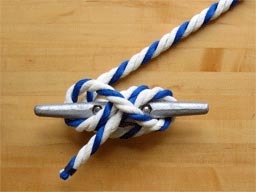 Fortunately for you, it’s now very easy to learn these knots. The two essential narrowboat knots are “the round turn and two half hitches” and “the cleat hitch”. The former is shorn on the left. The latter is below. The one on the left is for attaching your mooring rope to a post or a ring and the cleat hitch. The cleat hitch, strangely enough, secures a rope to a cleat. As you will invariably tie your narrowboat to or from a post, cleat or mooring ring these two knots will keep you out of trouble. You can probably work out how to tie the knots just by looking at the diagrams but, to make life even easier for you, there’s a marvelous website which demonstrates how to tie every knot you’ve ever heard of . In fact, there are 120 knots listed. All of them are animated and very clear and easy to understand. It’s a great site… and it’s free. I wrote this post just over four years ago. It was one of the first on the fledgling site. Since then I’ve often been approached with offers of new information to add to the site. About a month ago I realised that site subscriber Colin Jarman was the author of two books about boating knots. I asked him if he would like to write an article for the site describing the best knots for narrowboat owners. He kindly agreed. Here it is…. We handle ropes and lines most frequently on a narrowboat when mooring or getting underway. Mooring lines have to be fastened securely to stop your boat wandering off on a cruise of her own, yet they need to be easy to cast off and clear away when you want to leave your berth. This means you need to know a few good knots that will hold securely until you want to undo them and that will then be easy to release, even under load. I emphasise that bit – even under load. If, say, the water is draining from a lock and there’s tension in your lines, but you can’t free them, because the knots have worked too tight … well, you get the picture. The commonest ‘fixing points’ for mooring lines are bollards beside a lock, mooring stakes in the bank, a ring in a lock wall and a dolly or T-stud (cleat) on the deck. The knots I would recommend to cover these situations are the Round Turn and Two Half Hitches, the Lighterman’s hitch and the Cleat Hitch. 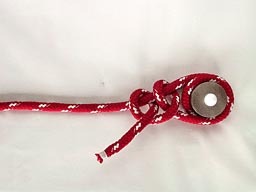 You should know how to tie a Bowline too, because it forms a useful loop in the end of a rope, but it’s not the best knot for mooring purposes, because it’s hard to undo when under load and to lift it off a bollard means gaining some slack in the whole line so that the loop can be lifted up and off – not something you can do under load. If you need a loop, though, or need to join two lines together, a bowline (or a pair of bowlines with their loops interlinked in a Bowline Bend) can’t be beaten. This is a long name for a simple way of fastening a line to a ring, a mooring stake, a dolly or a bollard. The name is also a perfect description of the parts of the knot. Begin by passing the end of the line round the bollard, dolly, mooring stake or through the ring so that it comes back towards you. Now take it round again so that it again comes back at you and completely encloses the object in a full ‘round turn’. Next pass the (working) end across the (standing part of) the line and wrap it round, poking the working end through between itself and the round turn. That’s the first half hitch. Take the working end on round the standing part, tuck it through between itself and the first half hitch and you’ve formed the second half hitch, completing the whole ‘round turn and two half hitches’. Pull everything tight and it will hold as long as you want. Importantly though, it will also be easy to undo even while the boat is pulling hard on it. Just pull the end back through the two half hitches and either unwind the round turn or hang on to the working end of the line and surge it round the bollard (or whatever it’s round) and control the boat. If you try to stop a moving narrowboat by just holding the end of a mooring line you will soon find yourself swimming in the canal, but take a round turn on (ideally) a bollard and the friction of the rope round the bollard will help you to slow her down and hold her. It’s much harder to describe the lighterman’s hitch than it is to tie it, but here goes. Use it for securing a mooring line to a bollard or dolly – if the rope is thin and the dolly tall, otherwise go back to a round turn and two half hitches. Take a full round turn on the bollard, then pass a loop (bight) of the free (working) end of the line under the standing part, up and drop it over the head of the bollard or dolly. Drop a second loop of the working part over the bollard, then pass a third loop under the standing part, up and over the head of the bollard. That’s it. Job done. No ‘tying’, nothing to jam, just a round turn and three loops. It will hold securely and to undo it, just life each loop off until you are again holding the boat with a full round turn on the bollard. Like the Lighterman’s Hitch, this avoids any ‘tying’. Take a full round turn on the upright ‘neck’ of the T-stud with the working end of the line. That gives you immediate control, because you can surge the line around the neck of the stud to control the boat. To secure the line, next cross the working part over the T and pass it under one horn. Cross over the top again and pass the line under the other horn. Now take a fresh round turn on the neck of the stud and that’s it. The line is secure, but can be undone under load, just by unwinding the line to the first round turn. The easy way to remember this round, cross, round pattern is with the word OXO. For a round turn (O), then cross, under one horn, cross and under the other in an X pattern, and finish with a round turn (O). If you are worried about security with a slippery rope, put two XXs on – think of kissing the missus, is one kiss enough? Follow the links on each of the knots to see an animated demonstration of how to tie them or see demonstrations of other knots not listed here on my YouTube channel. If you want to read more about simple knots and splices I can’t help but recommend ‘Knots In Use’ and ‘Knots and Splices’ (both published by Adlard Coles Nautical), because I’m their author.